4d [Greek salad ingredient] KALAMATA OLIVE. Oat. This is a nice find, even though, if I’m going to eat an olive, I will eat it separately, not as an ingredient in a salad and especially not on a pizza. Blecch! 8d [Where to find Sharks fighting Jets] HOCKEY RINK. Rye. San Jose vs. Winnipeg. 26d [What Hawaii was formed from] MOLTEN ROCK. Corn. I wanted MOLTEN LAVA, but I guess that’s redundant. A nicely-implemented theme with a solid set of interesting entries. My first thought upon getting the first entry was to notice the circled TAO, so the revealer (and/or the title) were necessary to get us looking in the right direction. And how about the fill today! I’m liking ALAN ALDA getting the full-name treatment as well as “CLUE ME IN,” GO GREEN, OIL TANK, ANTIGONE, Britishy FLAVOUR clued cutely as [Taste of Worcestershire? ], MINARET, TAXI RIDE, and TRADED IN. MAZOLA, IN LOVE, and the statue of DAVID are good, too. That is a strong set of fill! Is it just me or does TEA BALLS sound really icky? Also, KIA RIOS looks wonky in the grid, but I guess it checks out. And I don’t think I’ve ever heard of TAG SALE [One way to declutter] used synonymously with “yard sale” or “garage sale.” This website says it’s more of a northeastern term. Fave factoid of the day: [Dover’s county, both in England and Delaware] is KENT. Second favorite: [Princess born on the planetoid Polis Massa] is LEIA. What I love about this second clue is that you don’t have to know that bit of trivia to make a well-educated guess. 20d [Catch participant, often]. DAD. I played catch with my kids once. It didn’t go well. All in all, a superbly executed theme with sparkly fill throughout. Four stars. It took me a minute to figure out the theme here. DOUBLE-HEADERS is clued 35a. 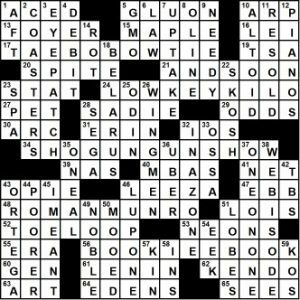 [Baseball rarities nowadays … or a phonetic hint to the starts of 17-, 26-, 48- and 57-Across], and those four answers are WON ON POINTS (not a familiar phrase to me), the song “TOO DARN HOT” (entirely unknown to me), FOR A CHANGE, and ATE LIKE A PIG. WON, TOO, FOR, EIGHT sounds like 1, 2, 4, 8, a series in which each number is double the one before it. I’d appreciate the theme a lot more if the phrases were zippier. Won by a landslide is a lovely 15, won my heart is 10, won his (or her) heart is 11, won the jackpot is 13. Too big to fail, 12. Would take some work to massage the others into a symmetrical theme set, but I’d have appreciated a more familiar theme set. Plus, boxing, ugh. Never gonna love a theme that starts out punching people in the head. Another debit: COLD ONES repeats the implied “one” in 17a. Aside from that, COLD ONES is good fill, as are DO-GOODER and SEQUOIAS. Overall, I wasn’t digging the fill that much. MUNIS ERG NOG ETNA EGESTS, meh. Nautical apostrophe madness! 52a. [Bo’s’n’s quarters], FOCSLE. Or FO’C’S’LE, more correctly. Short for boatswain and forecastle. 3.3 stars from me. Good night! 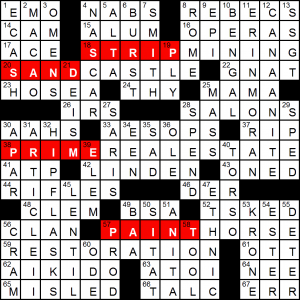 The stages of a DIY RESTORATION are found in consecutive answers: STRIP, SAND, PRIME and PAINT. They make a very natural-sounding set, none of which seemed to have the difficulty of having few natural phrases to choose from in creating a workable set. The grid has stacked themers on the top and bottom; it’s flashy, but it’s hard to tell whether it aided or harmed the overall grid quality. We do get paired non-theme 9’s crossing two theme entries as well, including full-name ERINMORAN, but at the cost of several forced short answers: AAHS/APAR/ONED and rarely-seen REBECS. Those bugged me lest than the opening EMO/MACAO/ECASH corner, which I can’t believe cannot be improved upon… Only ECASH is truly horrendous in isolation, but a 5×3 stack should have near limitless possibilities. This entry was posted in Daily Puzzles and tagged Alan Arbesfeld, Andy Kravis, J.A.S.A. Crossword Class, JASA, Jeff Chen, Jeff Stillman, Natan Last. Bookmark the permalink. At first I thought Jeff was merely repeating the last syllable, and I decided he was being incredibly lazy with SHOGUNGUNSHOW. It wasn’t until I filled BOOKIEEBOOK that I realized his theme is far more clever. Show’s me for underestimating Jeff. I am familiar with WON ON POINTS from boxing. At the end of a boxing match that was not decided by a knockout or TKO, the judge will announce the scoring (on points) of the three judges. Most rounds are scored 10-9; a decisive round might be scored 10-8 and a tie is scored 10-10. College wrestling is also based on points, but unlike boxing where you do not know who is winning on points until the end, you always know where you stand in wrestling as points are scored and registered immediately upon a takedown, escape or other point-scoring move. Just curious; how is ONE implied in 17A? WON = ONE. After the solve I read it as the Korean currency and not the past tense of win. Even though I knew how it supposed to be pronounced in the phrase. A not-so-rare mental lapse. NYT: a casual (/s) 70-word themed puzzle. Quite an achievement. I appreciate Arbesfeld puzzles because they speak my English. This is a tad opposed to solvers who like innovative language and new coinages. I guess, no, I know it’s my age, so thank you. NYTimes — anybody else try BIT for the storage unit 20A? (I did figure out from 3D that it was actually BIN before running into 9D:BITMAP.) Another write-over was “too daMn hot” for the theme entry 26A. 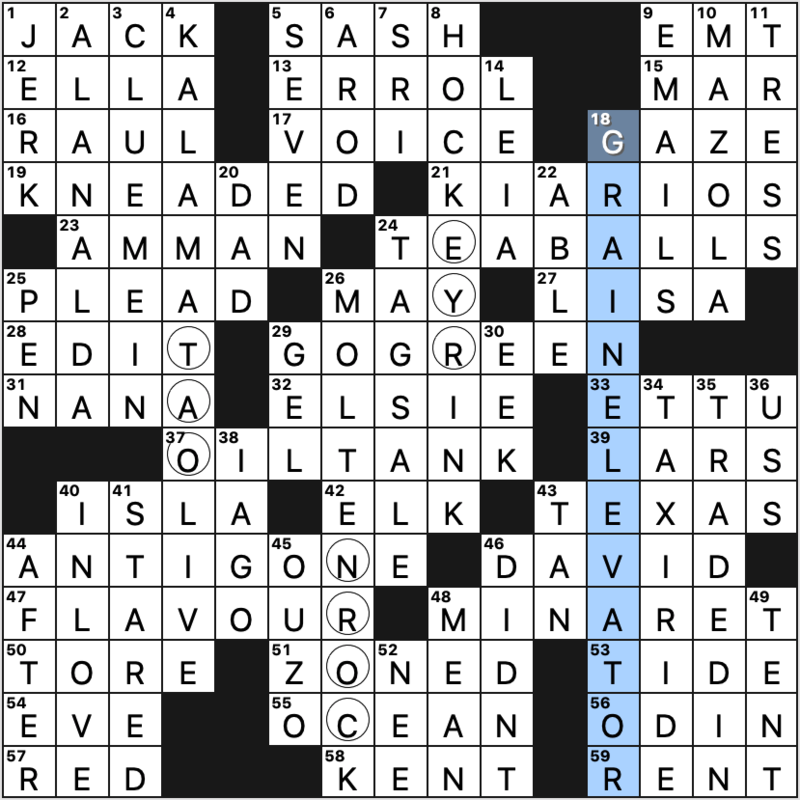 At any rate, I enjoyed the numerical theme, though with both 12D:COLD_ONES and 62A:TWICE in the grid I might have expected 4 and 8 words to appear somehow (and instead I get a 3rd in the clue for 2D:EROICA — not that I’m complaining). 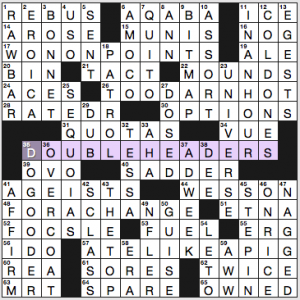 Yes, that’s a lot to ask for from a 70-word themed puzzle . . . 13D:EGESTS is a nice word, though “casts out” doesn’t quite feel right (there are better clues that don’t outright say “defecate”). I always considered EGEST to be vomit/perspiration, but whatever the “technical” definition, I agree it was a stretch to use it for “casts out.” Adam and Eve were egested from Eden?